The Girl in the Spider’s Web is a 2018 crime thriller film directed by Fede Álvarez and written by Steven Knight, Álvarez and Jay Basu, based on the novel of the same name by David Lagercrantz, which in turn is based on characters in the book series by Stieg Larsson. The film, a soft-reboot with different actors, is a sequel to David Fincher’s The Girl with the Dragon Tattoo, and the second installment in the American-produced Millennium film series. 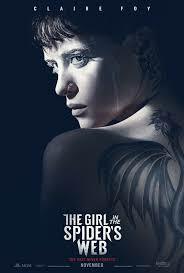 It stars Claire Foy, taking over the role of Lisbeth Salander from Rooney Mara, and follows Salander as she tries to rescue and exact vengeance for battered women. Sverrir Gudnason, LaKeith Stanfield, Sylvia Hoeks, and Stephen Merchant also appear in the film. The Girl in the Spider’s Web premiered at the Rome Film Festival on October 24, 2018, and was released by Sony Pictures Releasing in Sweden on October 26, 2018 and in the United States on November 9, 2018. The film received mixed reviews from critics, although Foy’s performance was praised.